Actor, director, and playwright David Mann has been a theatre artist in Minneapolis, Minnesota for over 25 years. He has written five critically-acclaimed solo shows and received a Bush Foundation Artist Fellowship for Performance Art/Storytelling. As an actor, David has worked the Guthrie Theater, the Great River Shakespeare Festival, and several Minneapolis-St. Paul theaters. 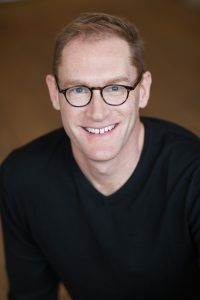 As a director, David directed the U.S. regional theater premiere of Disney’s Mulan for the Tony Award-winning Children’s Theatre Company, and he is Associate Artistic Director of Torch Theater where has directed over half the theater’s shows including a staged version of The Mary Tyler Moore Show. He has adapted and directed Romeo & Juliet and To Kill a Mockingbird for Park Square Theater in St. Paul, as well as directing several other shows there. As a playwright, David’s plays Corleone: The Shakespearean Godfather and Queens of Burlesque have been performed locally and nationally. He is thrilled that Classic Chic’s production of Corleone will be the show’s international debut. David is also a speaker and presentation specialist for legal and professional services. How would you describe Corleone: The Shakespearean Godfather? The play is a mashup of Shakespeare and the Godfather. It’s got equal parts of each. I didn’t want to do a straight transfer of the movie script into iambic pentameter, since I felt there was richer territory to be explored by incorporating iconic Shakespearean conceits into the narrative. So there are purely Shakespearean moments in the play that work in both worlds, and there are just as many dramatic moments as there are comic ones. I wanted the audience to feel that they were watching an actual Shakespeare play that happens to be about organized crime. It’s also a uniquely live experience – it’s written to be done by a relatively small group of actors with a lean, muscular performance style. The show rides the line between parody and homage – to both The Godfather and Shakespeare – and creates a new audience experience of both sources. Does someone need to have seen The Godfather to enjoy this play? Not at all. It’s obviously more fun if the audience knows The Godfather movies well, but the play stands on its own. I kept the plot points clear so audiences could relax and just enjoy it. I figured even if people had seen the movie it’s probably been a few years, so a little reminder here and there wouldn’t hurt. And it’s extra fun if the audience knows Shakespeare. There are just as many references to his plays as to The Godfather (Hamlet, Romeo & Juliet, Richard III, As You Like It, Julius Caesar…just to name a few), so hopefully its fun to watch how those references are played too. What do you think of Classic Chic’s choice to cast all the roles with female actors? How does this change the experience of the play, if at all? It’s always illuminating when Shakespeare is cast against gender, since it directs the audience’s attention to the universality of human experience. The same can be said of Classic Chic’s casting of Corleone. The story takes place in a heavily male-dominated world where women are relegated to the background. By casting all women, that balance is upset. We’re invited to see power (and its potential corruption) as something both men and women can wield with equal strength. If there’s anything that fundamentally changes with the all-female casting, it could be that we’re even more aware of how female characters are treated in the original Godfather story. I’m looking forward to seeing what the response is. I expect it to be quite positive! This may seem like too general an answer, but my favourite thing about this play is that it exists at all. I wrote one segment of the Godfather story in Shakespeare’s style as part of a Fringe Festival fundraiser in Minnesota in 2005. It was just a small piece, intended as nothing more than a silly sketch for one night. But afterward, everyone kept saying I should write the whole thing and do it as a Fringe show. So I did, and it went very well when we performed it that summer. After that run I was asked repeatedly to build the show out into a full-length show, which I did in 2009. It was difficult but rewarding to write, and I’m thrilled the show has had such a healthy life after that initial sketch in 2005. If I were to choose a favourite moment, I’d say it’s Michael’s monologue after he visits Vito in the hospital. It’s so utterly Shakespearean – a private moment inside the mind of a character who is wrestling with an enormous life decision. The movie just depicts Michael saying “I’m with you now” to his father, which is a huge reversal for that character. But being a film, this critical moment is captured in one short sentence (and Al Pacino’s face). In Shakespeare, we’d experience the inner workings of the character’s mind in language. So I wrote what I though that moment would have been if it had been in a Shakespeare play. I’m happy with how it turned out.